I currently have four bikes. 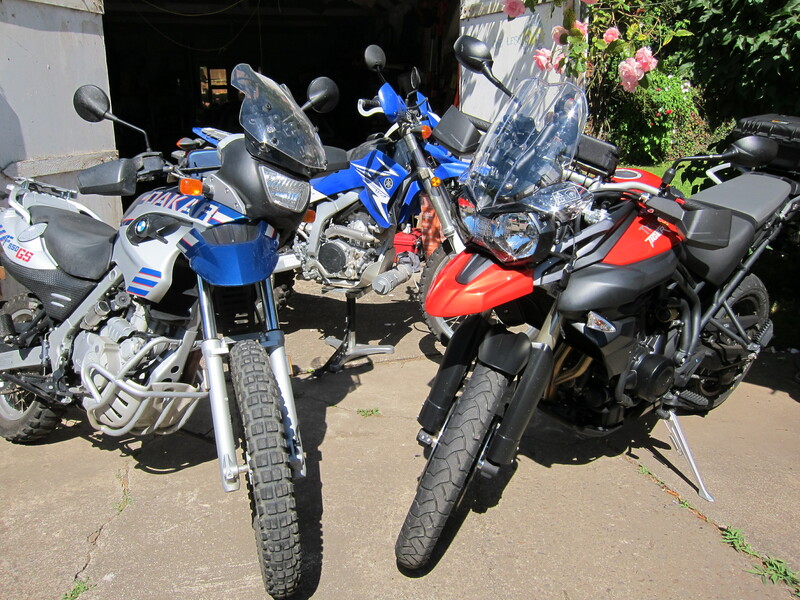 A 2015 Honda CB500X, a 2013 Ducati Multistrada, a 2012 Triumph Tiger 800 XC, and a 2009 Yamaha WR 250 R.
They are all very nice bikes and fit the gradient that to me best describes my favorite riding mode: adventure riding. The Ducati is the sport/touring, the Triumph is the touring/enduro, and the Yamaha is the enduro/dirt bike. 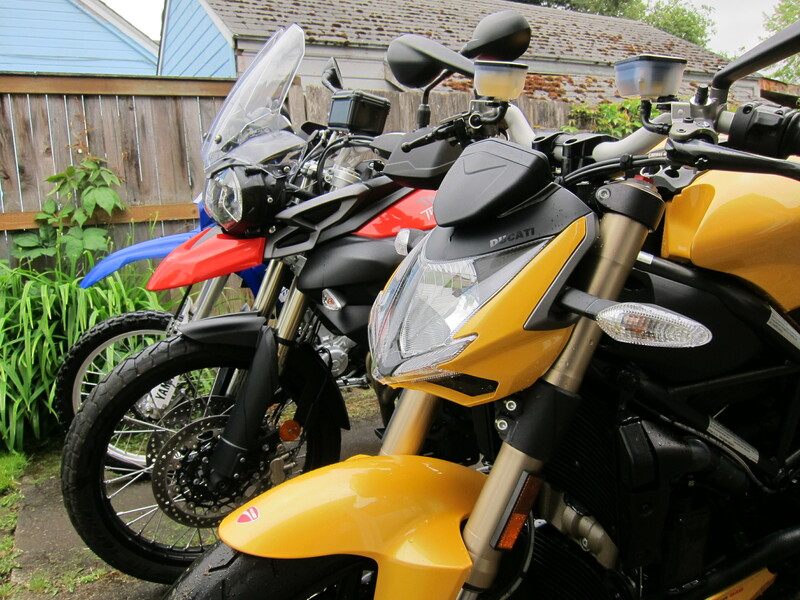 The Honda fits somewhere in between the Triumph and the Yamaha. So how all of this started? 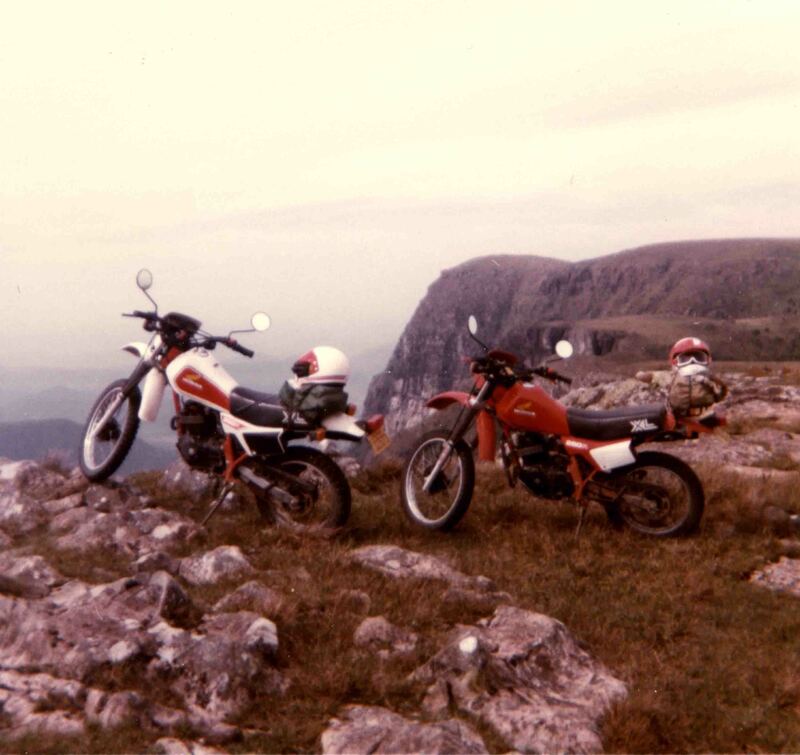 It all started with a Honda XL250 (the red one on the photo below), long time ago. Look, I used to have hair! It is a great bike for not only round the world travel, but also mid range adventure rides, mixing paved and non-paved roads. It has been great for trips to eastern Oregon and neighboring states. 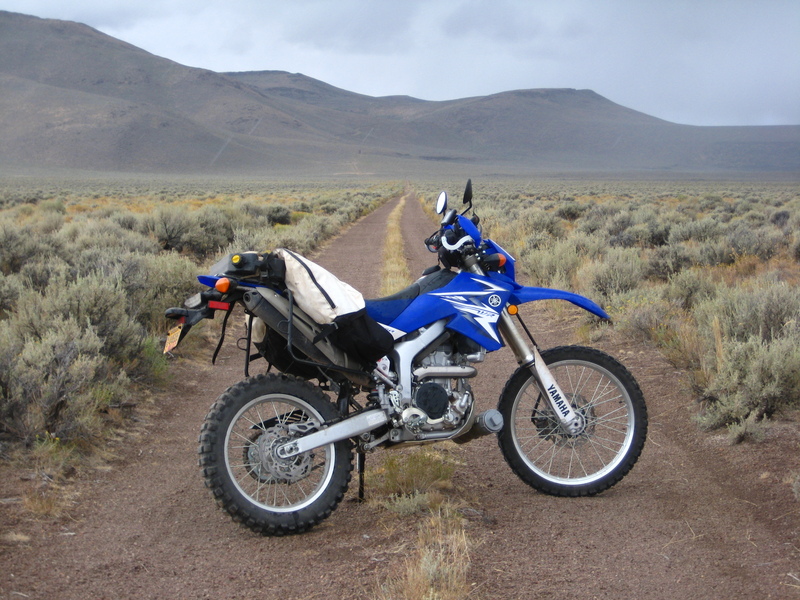 Here is a photo of the bike in the Lone Mountain Loop, in Oregon, June 2006. But one day I realized that although I liked the beauty of the Streetfighter, and despite all the fun it provided in riding the nice roads close to my house, and because of that, I had changed my riding habits because of this bike. I was designing my riding days for this bike, all I wanted to do was to ride only this bike, and my riding days got shorter and options to where I went became more limited. So I decided to look elsewhere and found the best compromise: another Ducati, but one that did all of that, but it allowed me to take it on longer riding days. That’s where the Multistrada came into the picture. But because of my rule of three bikes, the Yellow Ducati had to go… I’m sad for that, but I’m really happy for the Multistrada and all the fun this bike provides. It is an awesome machine! I hope to have it for many many miles. I hope it will be with me on riding trips within and outside the state. 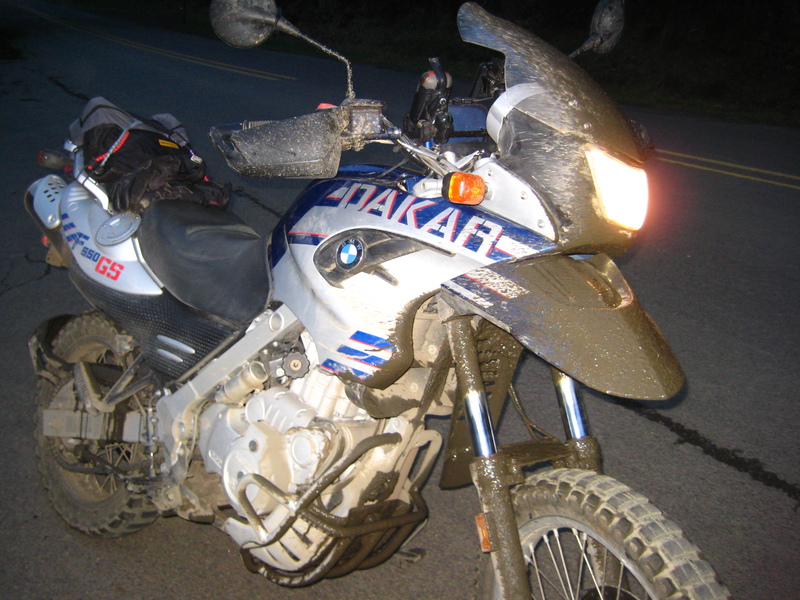 And I want to get the Tiger 800 XC a bit “dirtier”. 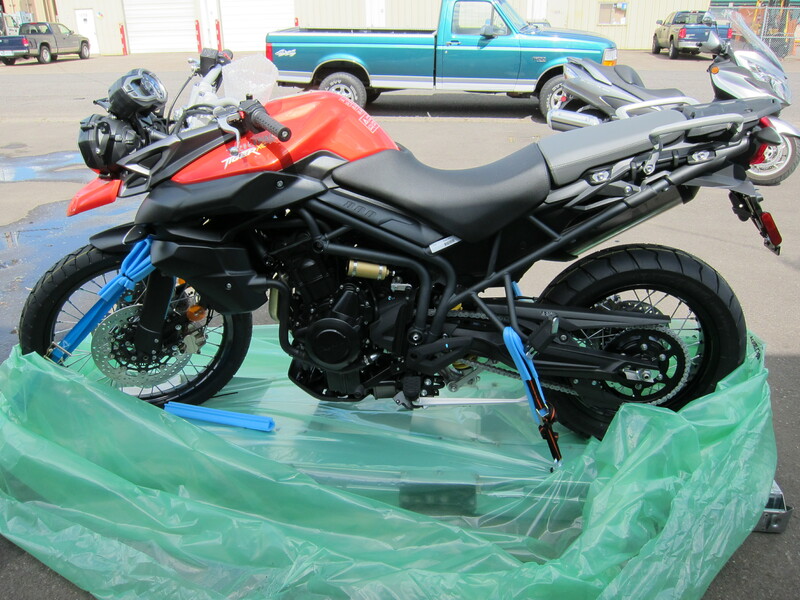 I have plans to add tires on the Triumph with a slightly more aggressive profile for better grip when riding off pavement, add some protection for the motor, make it more of an enduro bike, more of an adventure bike. Something I did not feel I could do with it before, because I did not want to compromise its touring and somewhat sport capability. Now I can let the Ducati assume the touring and sport role. Which it does very well, mind you. And the Triumph can be the enduro/touring bike, a more appropriate role for it as well. And all is good in the shed. For now! That was then. This is now… As of January 2016 the rule of three has been broken. Now it is the rule of five. But for now I have four motorcycles. Time will tell if I will go back to three or go up to five. Césinha, agora já tens uma moto vermelha para me emprestar caso passe por aí…. I’ve recently got a Tiger 800 which I just love and so I’m curious which Pelican case and mounting system you’re using at the back and what the little otter box is at the front ? All the best for the holiday season, ride well! Thanks for writing! The Tiger 800 is a great bike. I would say it is a nice match for Australia’s long distances. The Pelican box is a Storm iM2200. And I mounted it with the QFS universal mounting kit from Caribou Cases (the case can be removed by three quarter-turn hand-tight screws). The Otter box is the 2500 and in it I store my wallet, a point and shoot camera, and my I-phone. I will soon do a write up on my bike’s set up for travel, which includes the Giant Loop bag. In it I will show how I got the Otter box installed. Several of my friends and I have looked at your OBDR ride reports — thoughtful, full of great stuff, so thank you! 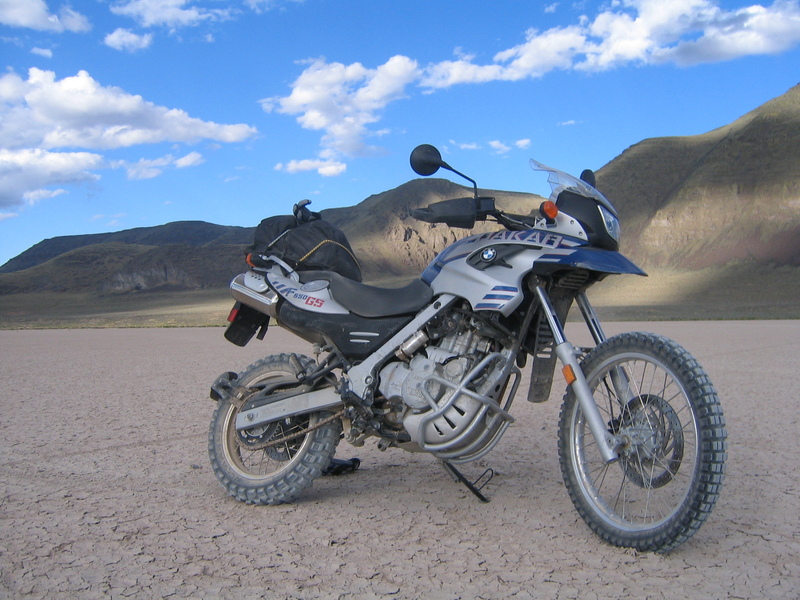 We’re preparing to do the northern part of the route this summer, and at this point, I’m planning to use my ’06 Dakar. I’m interested in your thoughts on how you think the bike will do. 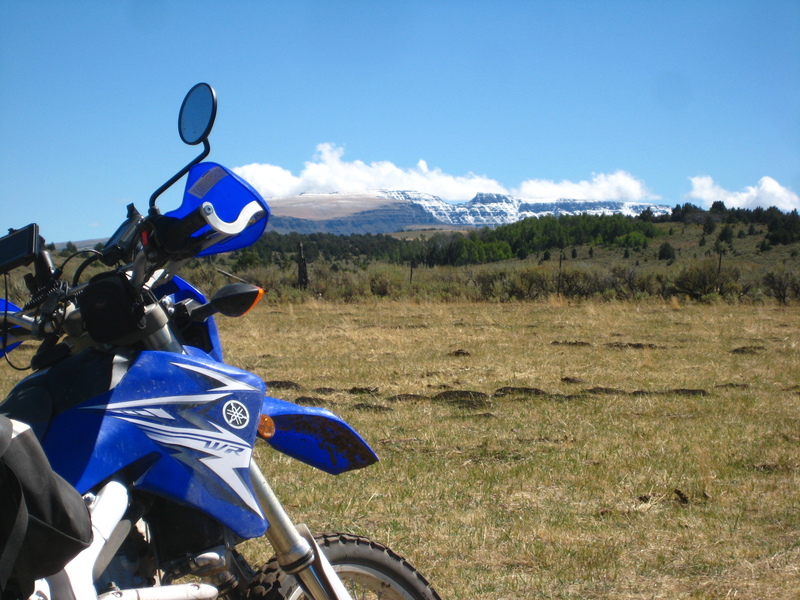 We recently did some riding in the Upper Nestucca OHV area. The bike has newer Pirelli MT21s front and rear, so the traction both on and off road was good. We messed around in the snow a little, but it was just too deep in places so we couldn’t make it clear to Tillamook. When we played on some of the trails and the bike did okay, but it’s top heavy which takes some of the fun out of riding. I’ve had the same experience with it’s weight and handling in other areas too. My expectations for the Dakar could be all wrong. 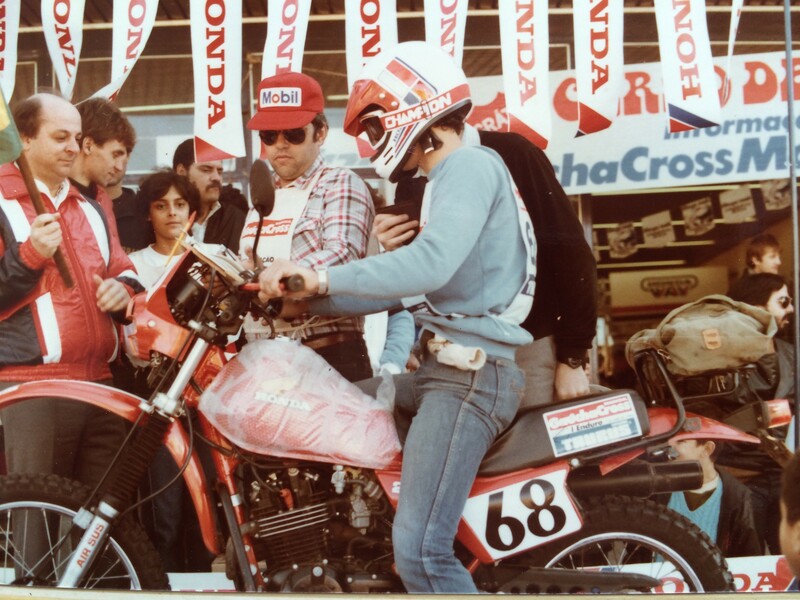 Years ago, I raced enduros on a Suzuki RMX 250 that had the suspension revalved, etc. I’m not expecting the Dakar to handle things like the RMX, but I’m struggling to see the point of the Dakar on anything more challenging than a fire road. I can take the bike down single track trails, but once the going gets a little tricky or muddy, you can really feel the bike’s the weight and turning limitations. The fun factor drops at that point. 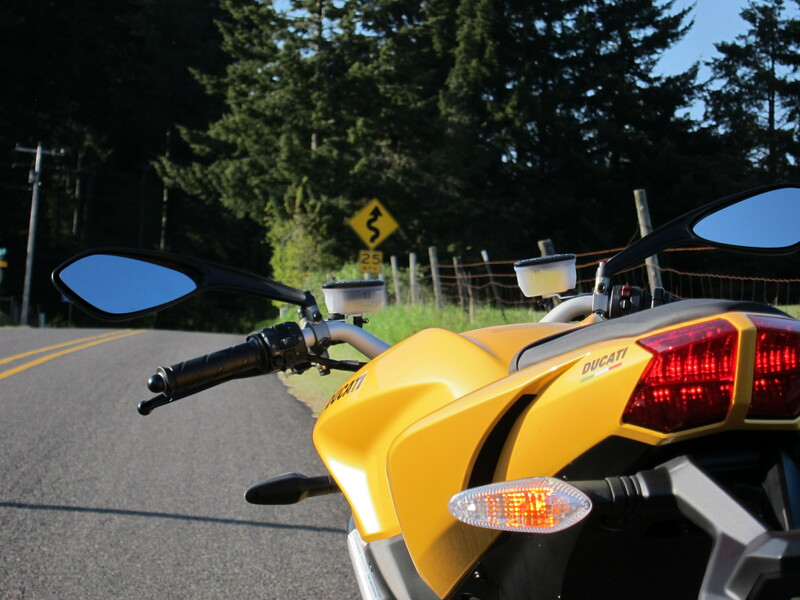 1. a bigger bike that can handle two-up travel comfortably and fire / gravel roads – something like a VStrom 1000. 2. a more nimble, dirt-oriented bike to handle dual-sport and adventure riding – something like your WR250F with 10 more ponies. Your thoughts would be greatly appreciated – thanks! I agree with everything you stated about the Dakar. It is a mid of the road bike, perfect if you can only have one bike. But if you can afford two bikes, I would go with the options you propose. The WR250R is definitely too small for 2-up. But it has enough power to keep up with the bigger bikes (450’s and 650’s) on any dirt road. It is such a nimble and fun bike to have. And it is fun on paved roads too, but don’t expect to be cruising above 65mph with it. It can do, but it won’t be fun. 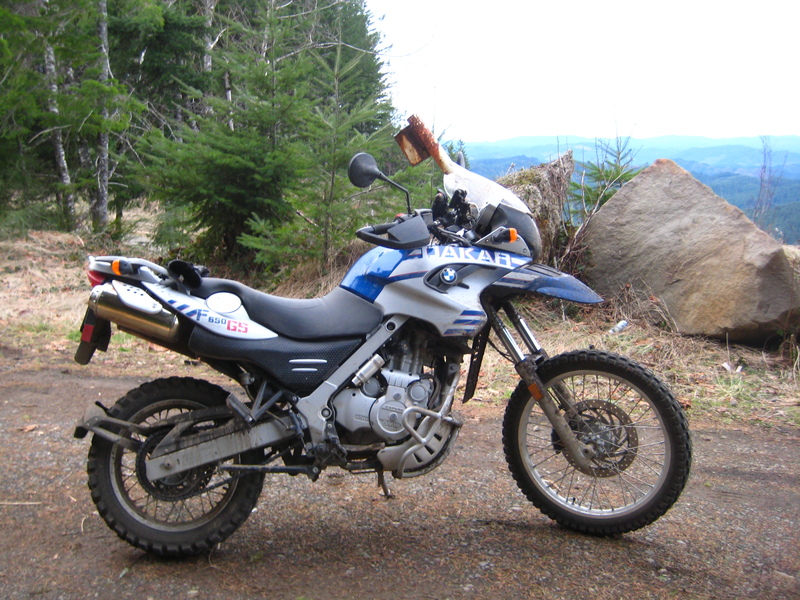 I have the Tiger 800XC for the longer distance and better dirt roads. It will ride well on gravel. But I don’t think it is an ideal bike for that. The Dakar does it better. But 2-up on the Dakar, although doable, it is a bot of a challenge. I know people who traveled far 2-up on a Dakar. I plan to sell my Dakar this year and buy something more street aggressive. That way I keep the WR250R for the dirt. The Tiger for touring. Perfect bike for that! And the surprise bike (I already know what I want) will be for day and weekend rides around the state. I think you are on the right track, Dave. Having said all of that… just in case you don’t get to buy the other bikes this year, I can say the Dakar will do well everywhere on the OBDR. I’ve ridden it on places that are worse than what you will encounter in the OBDR and it did fine. Because it should be dry in the summer, it will be perfectly alright for the Dakar! Only challenge will be the places where there is deep sand, but they are a very very small portion of one of the routes (lost forest area, north of Christmas Valley). So I would not be worried about it. Loving your blog; thank-you – it takes me away from my office job for a minute or two. I bought a BMW GS650 Sertao a couple of months ago. As you’ll already know, it’s basically a 2012 version of the Dakar so probably not a great replacement for your Dakar, but I thought it’d be a nice homage to your Brazilian heritage! Like you, I had a few smallish dirt bikes when I was a kid, and recently got back into biking with the purchase of my Sertao. I’m really enthusiastic about making some great trips similar to the ones you share with us. I’ll let you know if I make it out to Oregon! Well, you bought a great bike. Congratulations! These bikes are bullet proof, have great fuel economy, are comfortable and can cruise all day at 65-75mph. Many riders have taken this bike on trips around the world. On my list of related blogs, there is one called “world rider”. Check it out. 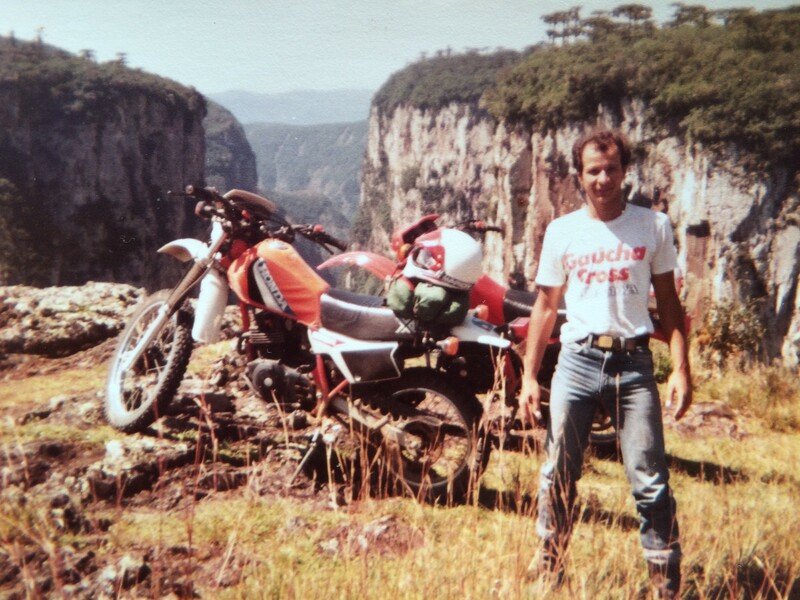 This guy, Karl Allan has taken his F650 GS Dakar around the world. Another famous rider on world tour, Striking Viking has also taken an F650 GS Dakar on a similar trip. I’m glad to know BMW brought it back. Despite under a new name, it should be the same bike as the Dakar, and I bet it has been improved here and there. Thanks George. 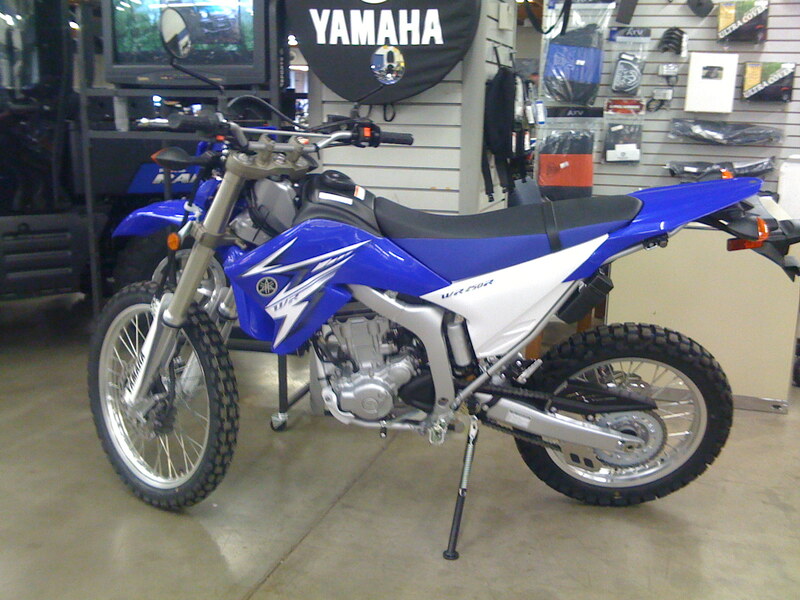 That WR250R is a really nice bike, light and surprisingly smooth for a small 250 single. I just wished it had a few more extra horses. But on the trail it keeps up with the 400’s and 650’s. Really enjoyed your write-up. In addition to my trusty dual street/track bike (a 2008 848), after experiencing it for a week of fun but also painful riding around WV, NC and TN backroads, I just decided I need an ST bike for such trips. The 2013 MTS 1200 sounds a great bike, the perfect choice, but I just cannot spend that money at this time. There’s an attractively priced demo 2012 MTS 1200 S available right now (which I know well, as I got one in summer 2011 and am still keeping it in Italy for when I visit), but there’s also an immaculate 2012 Kawa Concours 14 available with less than 1,000 miles and more than 2.5 yrs warranty left. The price difference is more than $5,000 between the demo Ducati and the slightly used Kawa. I am still torn, but will decide in a few hours. Maybe, just so that I can experience the competition, I will go for the Concours 14 for a couple of years and then switch back to the family and a latest generation Multistrada. Because you already have one MTS in Italy, nothing wrong about diversifying a bit and figuring out what the others bikes are all about. But hopefully you can keep your 848, just to keep that Ducati flavor around, when you want to experience the V-twin feel. Then one day you get your street/track on a next generation Multistrada. By the way, I really enjoyed the little Hyperstrada. 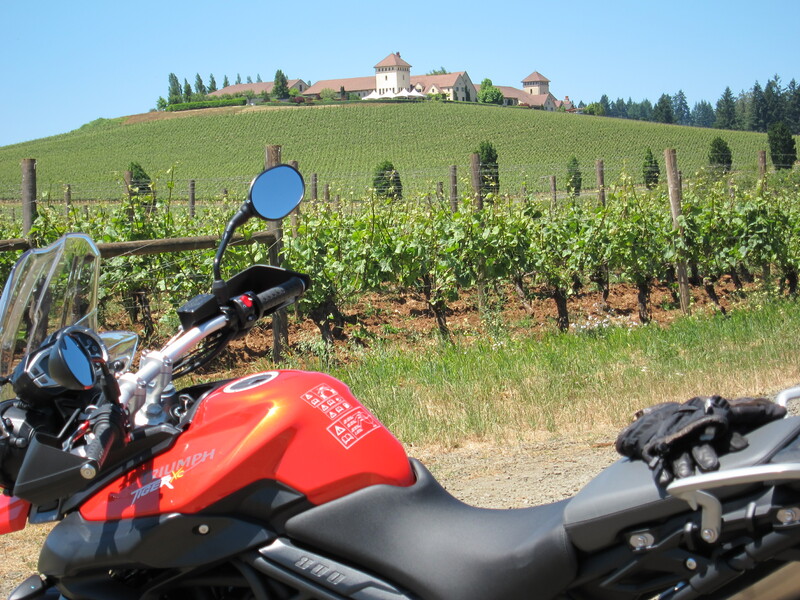 Not quite the touring bike the Multistrada is, but it is a lot of fun! Cesar, indeed, wise words. That’s the choice I made. And I will certainly keep my 848, fitted with lighter forged aluminum wheels, a slipper wet clutch, a racing rear set, and a GPR steering stabilizer to make its handling even sharper. It is a wonderful bike for the track and for spirited rides in the backroads (2-3 hrs one way to a rest spot, not much longer than that!). Sounds like a great plan to me, Gianni! And your 848 sounds like a sweet machine. My name is Dario and I am from Verona in Italy. Yesterday I was browsing the web looking for informations about differences of Multistrada 2012 vs 2013 and I came across your site, which I really liked a lot for the stories and the pictures. I also liked your byke selection and I would like to ask you an opinion. I come from bykes such as Yamaha R6 and Kawa Z750, but last year I got a WR 250 R since I wanted to do some offroad as I did when I was in younger (I am now 44). I like this byke a lot, but in Italy now there are a lot of restrictions for offroad use, plus this byke is not really ideal for any travelling on the road, which I knew already when I got it. Anyway, the good weather now is back and I feel it’s time for me to move to another byke, more suitable for some medium-range travelling as well, and I am now considering the Multristrada 1200 or the Tiger 800. For a number of reasons at the moment I want to keep one byke only. If I look at comfort and the possibility of some simple off road when the opportunity come, I guess the Tiger 800 would be the best option (I also tried the Tiger 1050 Sport yesterday but I tought it was a bit too heavy for my taste). If I look at performance and emotions on the other hand, the Multristrada would definitely be the best choice. So I was wondering, since you have both, if you had to choose to keep only one byke in your garage, which one would you keep between the Mustristrada and the Tiger? Thanks in advance for your answer and for the time you dedicate to this site. You know, I often ask myself this very question. If I were to keep only one bike what would it be? If my decision is between the Tiger and the Multistrada, and I want to be able to ride light gravel and dirt roads and then still enjoy the power and performance on the road… neither of the two. I would go for the new bike in the market, the KTM 1190. It is having problems in some essential areas, and KTM is working on it, so I would not buy one now. The 2015 model may be the good one to buy. 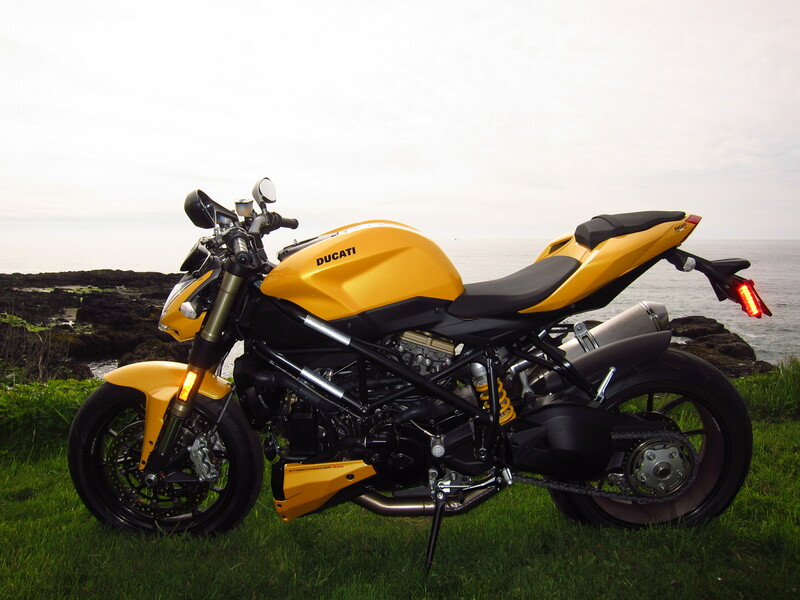 But if I would only ride paved roads, and travel the distance, I would certainly go for the Ducati. For a few weeks now I was only riding the Tiger, and I was really enjoying it. And then I got the Ducati out last weekend and the power difference was so evident and fun. On the other hand, most of the time the power is not really necessary. 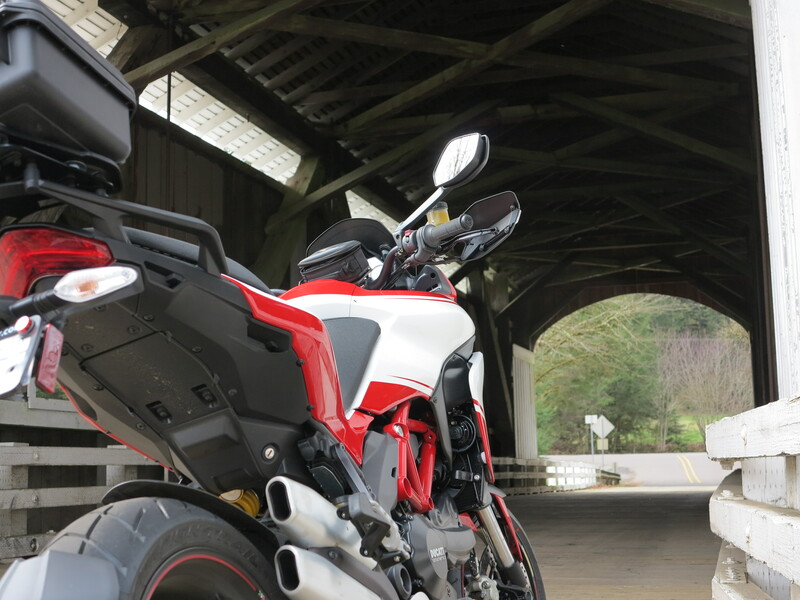 There is one Ducati that is real fun if you don’t need too much power, and that is the Hyperstrada. Agile on the streets, it can be a lot of fun on the road and the mountain curves, but it is not quite a long distance traveler. That’s the other element, if you are going to travel long distance, then you would want more comfort. In the end, the bike that you want is the one that speaks to you when you ride it. Was the Tiger fun? 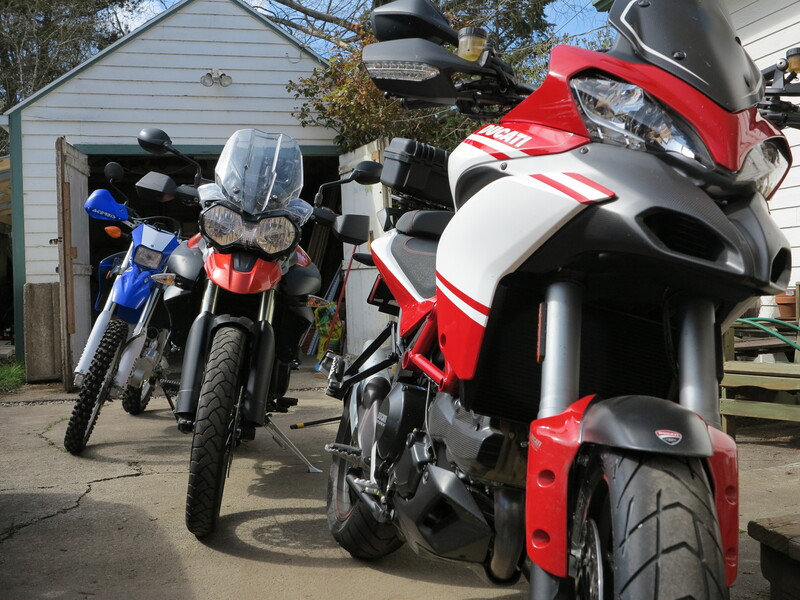 And did you take the Multistrada out for a test ride? The Tiger 1050 Sport I tried yesterday was nice, however, as you put it, it did not speak to me the way I had hoped. So if I go for Triumph I think I would stay with the Tiger 800 XC, which I also tested recently and that I liked, and that would also give more comfort and some kind of off road caracter. Regarding the Multistrada, I did use a model S 2012 for some hours a few weeks ago, but that was in the province of Buenos Aires in Argentina where they have mainly straight roads and highways, and at the time I thought how great it would be to ride it in the region where I live in Italy, with plenty of curves and mountains. Anyway, that byke really did speak to me, loud & clear, through a wonderful Mivv exhaust without DB killer… but at that time I was not seriously considering the MTS, since I was not really considering a Ducati 2 cylinder for my purchase, thinking of potential high maintenance, and high price to buy the byke. Then this week somehow the MTS idea hit me, and I started looking for more info on the web, and it turns out that the byke seems to be quite reliable, and the cost is not as high as I though, I saw some used 2012-2013 models with 3-4 thousand Km for 11000 to 13000 €, which is not too far from my initial budget. So here I am, with a monkey on my back. This is an Italian way of saying (avere una scimmia)…meaning when you are thinking too much about something, it kind of feels like you have a monkey on your back bothering you the all time…but I have to say that I like it since I like motorbykes…less so for my lady that thinks (rightly) that I spend too much time on this thing these days. 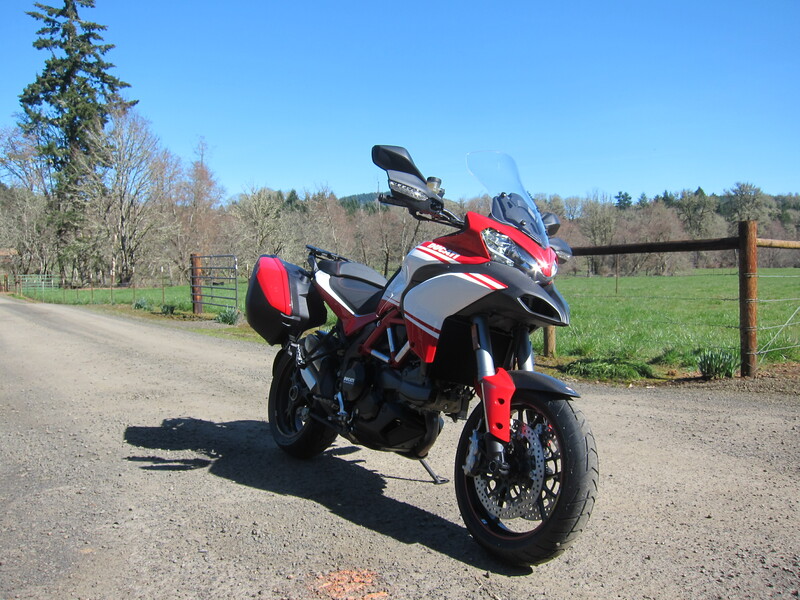 I test rode the Tiger 1050 and to me it was not as fun as the Tiger 800XC, I agree. 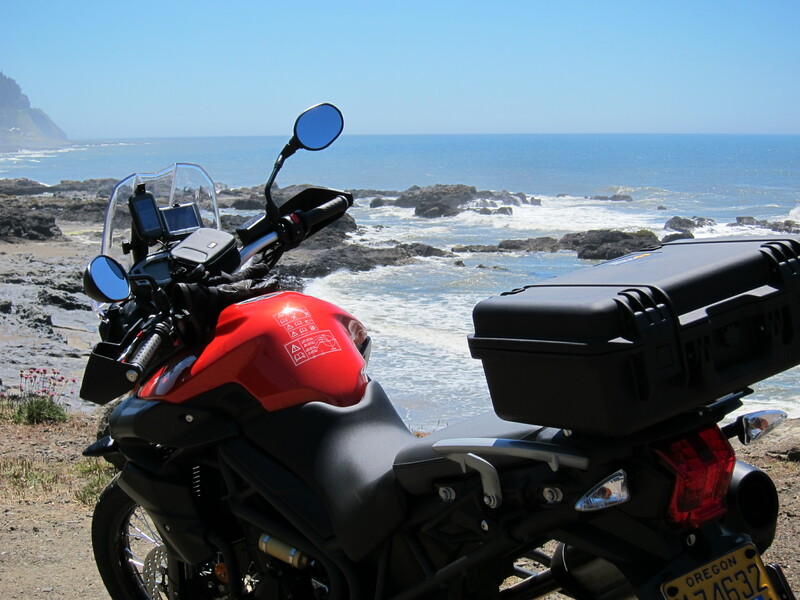 About the Multistrada you tested in Argentina, with the MIVV exhaust… at times I feel my Multistrada is too quiet. But in the end, it is a good think. About la tua moglie, thinking you think too much about motorcycles, doesn’t she spend time on line checking Louis Vuiton bags? Mine does. Deciding about motorcycles é una buona scimmia to have. If you could have two bikes, then it would be a constant problem deciding which one to take out for a spin. 😉 Better to have only one. finally I made up my mind, got rid of the little monkey, and got myself a little Tiger 800 XC this week (as my own birthday present). Somehow I was thinking about this byke for too long and I just had to have it and use it, so I thought that the MTS can wait, maybe next year, we will see. The Tiger is really nice, the only missing thing for me is that it is not really inclined for any wheelies, but that I knew already. I am planning to do some long range travelling this summer which I think is one of the ideal uses for this byke. One other thing that I am noticing, it seems to me that the gears a bit too short and close to each other, expecially from the 4th to the 6th. I have ordered today a 17 pinion , instead of the original 16, to see how it changes. I have read on some forums here in Italy that many people tried this solution. 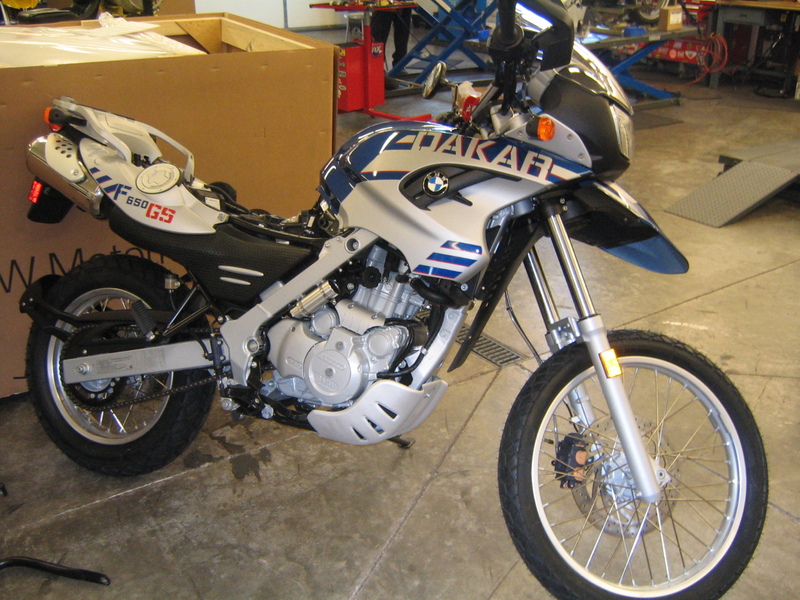 Congratulations on your purchase, the Tiger 800XC is a very nice bike, and reliable as well. I agree the gears are all close to each other on this bike (tall first and short 6th). For general use I don’t see this being a problem. Only time I felt the gears were too close to each other was when I was pushing the bike hard on mountains curves at speeds between 2nd and 4th gear. It seemed, when changing up gears, that I had not changed at all. A change in pinion, in my opinion, will not change how close they are from each other. However, moving from 16 to 17 in the front, it will give a longer leg for 6th gear, but it will make the tall first gear even taller than it is. This change works better if you travel on highway. Goes against you if you need to go slowly on rough terrain. But it seems you will be using this bike more on the highway, so that will probably give you a better fuel consumption (less fuel per 100 KM). I was wondering if you could share any tips/tricks/advice on the installation of the Caribou top case on the Multistrada. My understanding is that the installation involves drilling holes in the Caribou mounting plate to match the 4-hole pattern in the passenger grab handles. Drilling the mounting plate and removing the hole covers from the grab handles makes me slightly nervous…anything I should watch out for? I actually bought Ducati’s rear luggage rack ($276). Then I bolted the box on the top shelve of the luggage rack (it has a top shelve that expands laterally for a wide platform). Then I got rid of the top shelve and bolted the box to the base of the luggage rack. The luggage rack fits the OEM grab handles very well. I found your site while researching the 2014 Multistrada 1200. Thank you for providing such interesting and informative articles! This has become one of my new favorite blogs and I look forward to following your adventures in the future. Im currently riding a KTM 950 Supermoto and may be adding a Multistrada to the stable later this month.